The concept behind this ephemeral artwork is the creation of young british artist Stuart Semple. 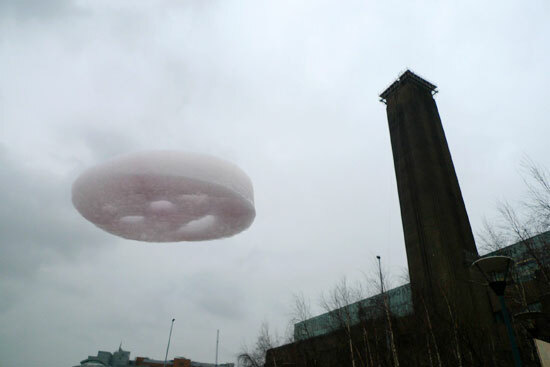 the clouds were displayed in london near the tate modern. Semple explained his motivation, 'I just wanted to make a piece of work that would cheer people up a bit.' he continued saying, I know at times like this it's easy to make creativity a low priority but i want to show that on a very human level an artistic idea might be able to do something important even for a fleeting moment.' the piece was created using helium, soap and vegetable dye. semple release one pink-tinged cloud every 7 seconds, with each lasting only 30 minutes. 2057 completely biodegradable clouds were released in total.